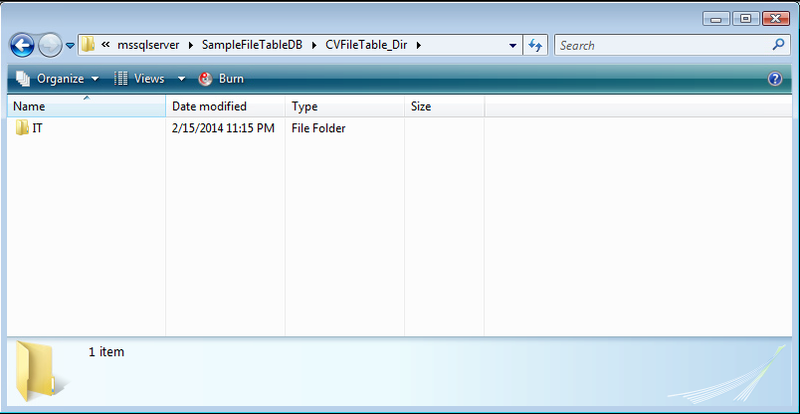 Today, I came across a situation, where I had to perform an activity similar to temporary table cleaning in more than one database. So I started thinking about the shortest possible solution. After some research, I found two possible solutions and one of them was sp_MSforeachdb. 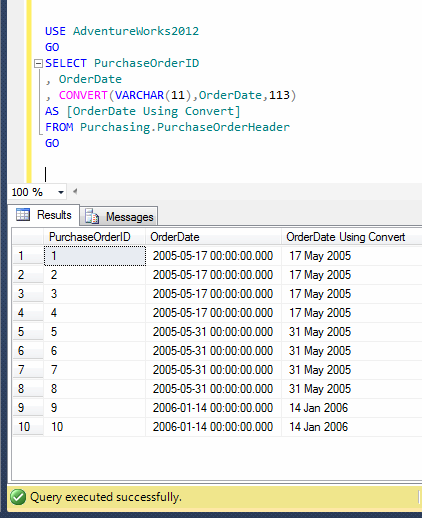 It is basically an undocumented stored procedure in SQL Server and it is very handy when you need to perform / achieve some tasks in different databases at a time. 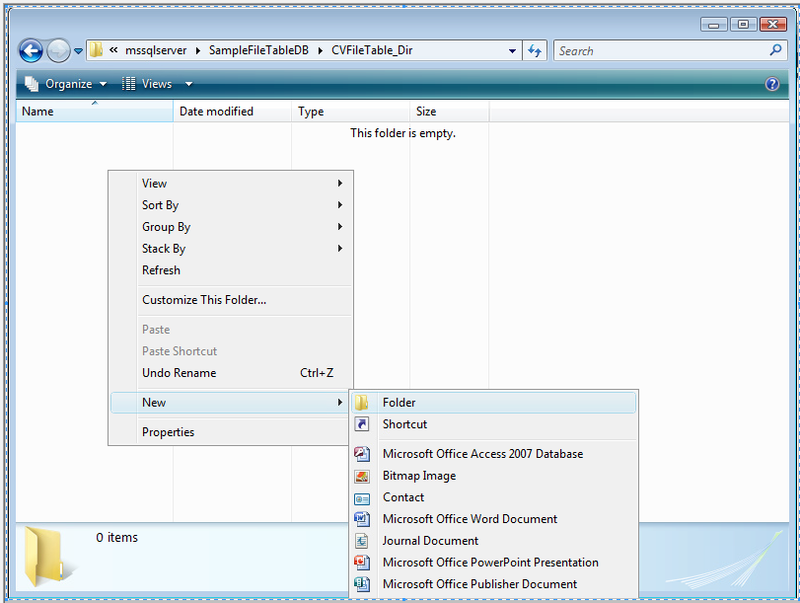 However, I need to perform the above mentioed task NOT IN all databases but few of them only. 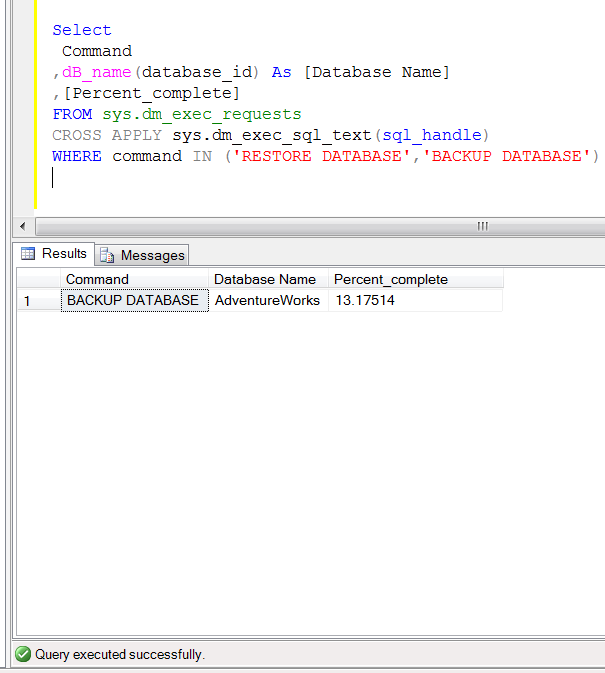 So I started doing some testing to see how to achieve database filter in the sp_MSforeachdb. After couple of testings, I finally found the way to execute a set of commands on specific databases using sp_MSforeachdb. Let me know if you came across these situations and what was the solution ? Note : It is not recommended to use sp_MSforeachdb on production databases. 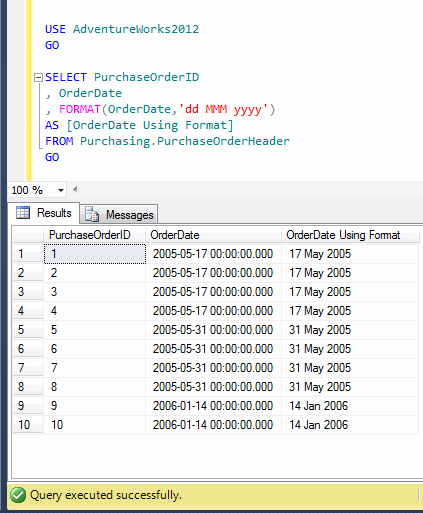 I came across this query from one of my SQL Server developers while he was doing some R&D in SQL Server and suddenly the SQL Server started giving him fixed number of result sets (5 rows of each table/views) as shown in the picture below. First of all he tried all the way to fix it including the restart of development SQL Server. It seems, he had to re-install his SQL Server ;). He called me, if I can help him to fix it. I asked him few queries and started doing the troubleshooting and finally fixed the issue. Let me reproduce the same issue and fix it step by step. 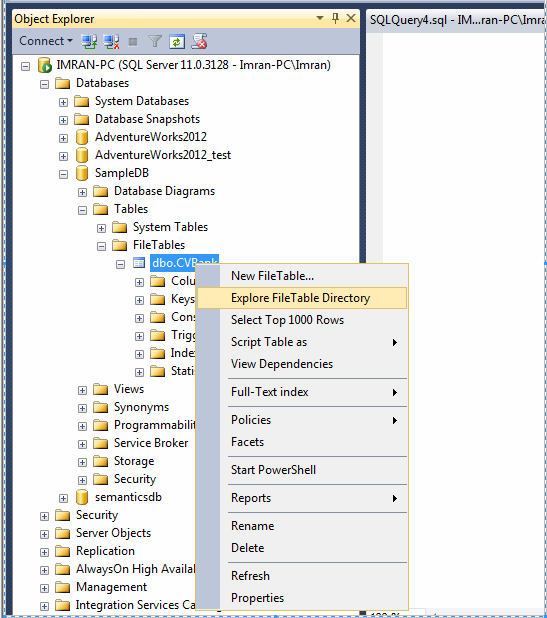 Open SSMS (SQL Server Management Studio) and go to Tools >> Options menu as shown in the image below. Once you select options menu, an options dialogue box will pop up. 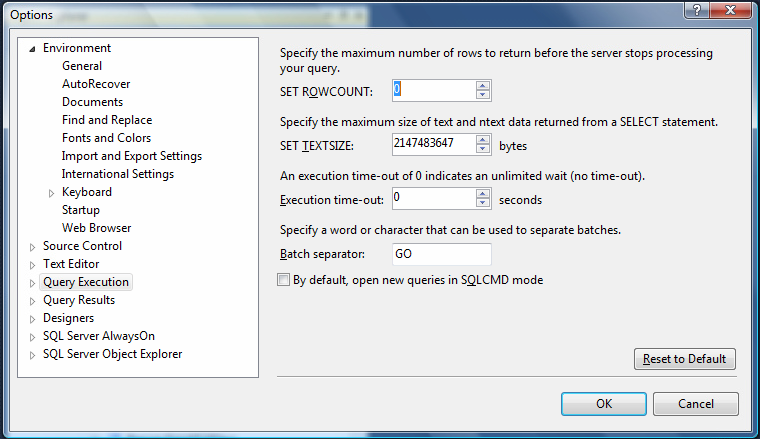 Now you need to select “Query Execution” from left hand pane and make SET ROWCOUNT =0 as shown in the image below. By mistake my developer put 5 in the SET ROWCOUNT and it returns 5 number of rows in each result sets for each table and view. Once you are done press OK button. 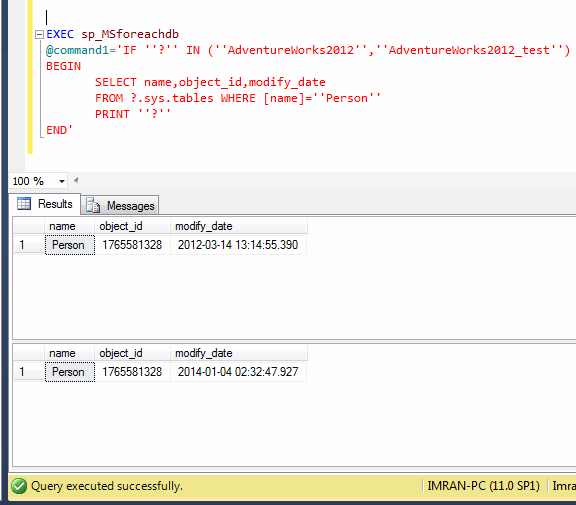 Now open a new query window and execute the same queries. This time, it will give you the exact result set instead of 5 rows. Let me know if you guys came across this issue and how did you fix it ? 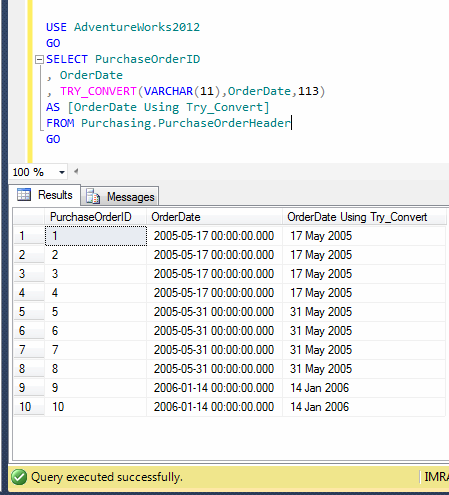 Sometimes, when you create a new object using SSMS (SQL Server Management Studio) and try to use that newly created object, it shows a red line underneath that object and if you move your mouse cursor on that object, it says the object does not exist, but on the other hand it manipulates the query too, as shown in the picture below. When I came across this issue earlier I thought it could be a bug. 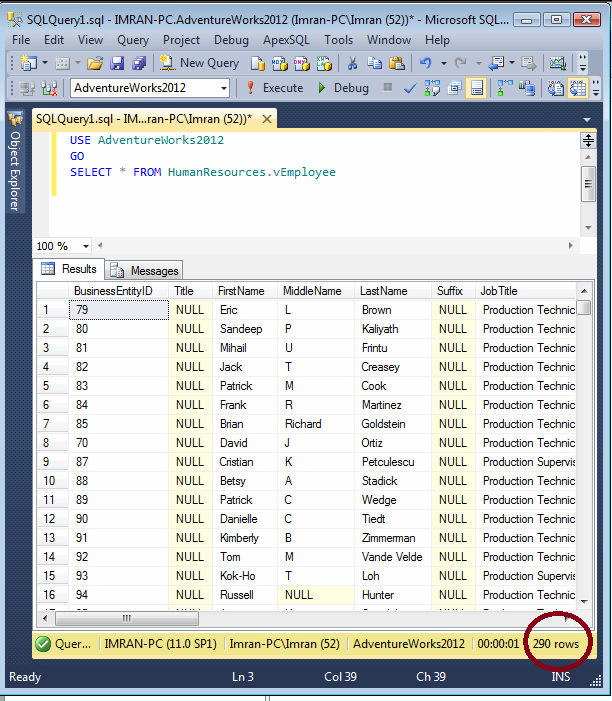 But actually it is not, so what is wrong with SQL Server ? 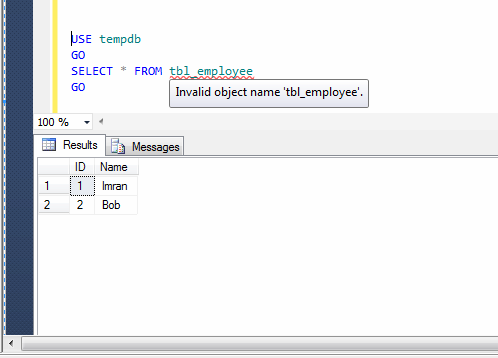 Basically once you create a new SQL Server object, your newly created object does not get updated in the IntelliSence Local Cache and due to this, it shows red line underneath that object. So you just need to refresh SSMS IntelliSence Local Cache and once you refresh it, IntelliSence will automatically add newly created object in the cache and the red line will disappear. Now, the question is how to update it ? You can achieve in two different ways. Given below are the details. 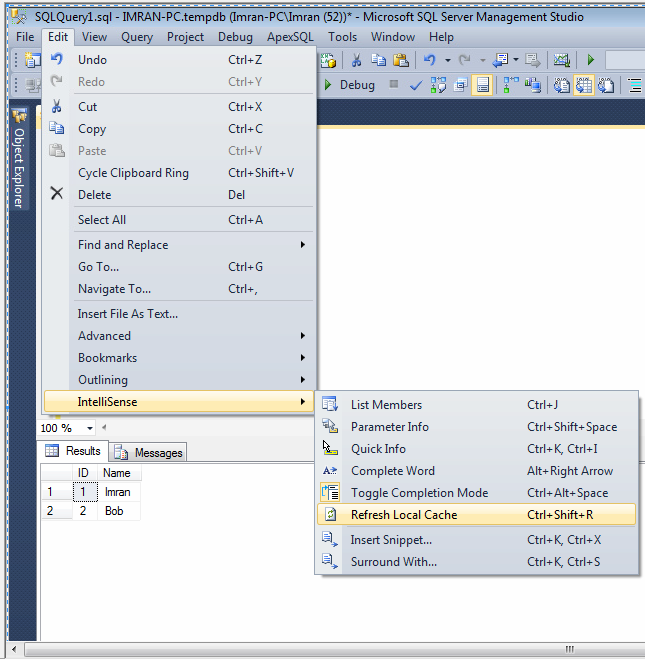 In this method, you need to open SSMS and just need to press “Ctrl+Shift+R” and Intellisence Local Cache will be updated automatically. 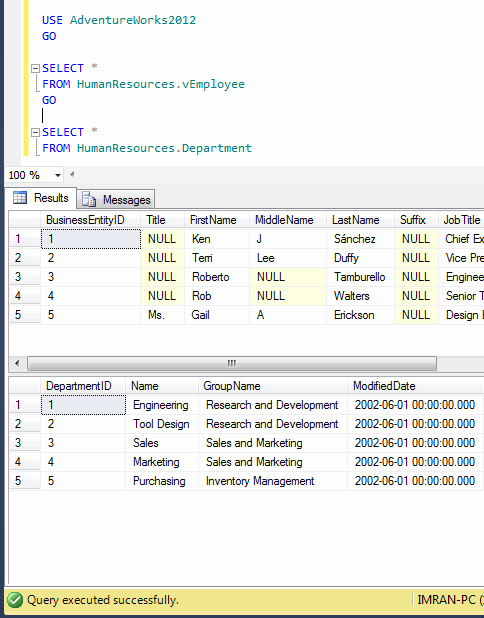 In this method, you need to open SSMS then go to Edit menu and point IntelliSence and select Refresh Local Cache and once you select Refresh Local Cache, your Intellisence Local Cache will be updated automatically as shown in the picture below. Let me know, what you guys did, when you came across it first time 😉 ?